If you know me well, you know I’m a very picky eater. Over the past several years I’ve been trying new things, mainly things that I cook and have complete control over. Guacamole is something I NEVER thought I would enjoy, but lately I’ve been addicted. Smooshy green food has never sounded appealing to me, but when we were on vacation with another family, over Spring Break, they ordered some guacamole that looked very fresh. 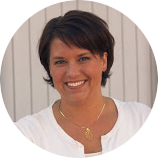 I tried it – just a little, and I was surprised at how much I liked it! Who knew? Me. Liking smooshy green food. 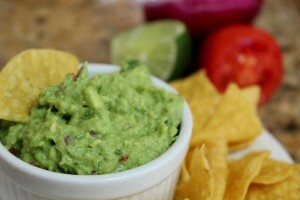 So, here it is… my recipe for homemade guacamole. Peel and chop 1 large avocado. Use a potato masher to smoosh (technical term) the avocado to desired consistency. (I like mine a bit chunkier.) Add cilantro, onion, tomato, lime juice, and salt. Stir gently. Serve with tortilla chips. This is one of my all-time favorite recipes to serve for brunch or a Sunday morning breakfast. 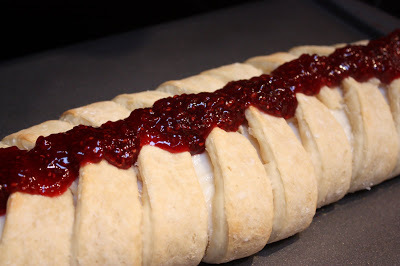 The Jam and Cream Cheese Braid is also beautiful for Holidays! 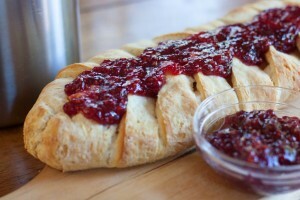 My grandma used to make this on Christmas and it quickly became a family favorite. I tend to make it quite often because it’s SO easy and looks like you spent hours in the kitchen. The recipe involves yeast, but DON’T be afraid! I know working with yeast can be intimidating, but all you need to remember is that yeast likes the same temperature that we do. When you are dissolving it in water, you want to use water that is the temperature of bath water. If it’s too cool the yeast won’t activate and rise. If the water is too hot, it will kill the yeast. Test your water with your finger. If you wouldn’t set foot in a tub of water that temperature, adjust it until it feels just right. Dissolve the yeast in warm water. Combine Bisquick, egg, 1 Tbsp sugar, and yeast/water mixture. Turn the dough onto a floured board and knead until it is no longer sticky. Spray a cookie sheet with cooking spray. Roll the dough into a 14"x9" rectangle. Combine the 8 oz package of cream cheese and 1/2 cup sugar. Spread down the middle third of the dough. 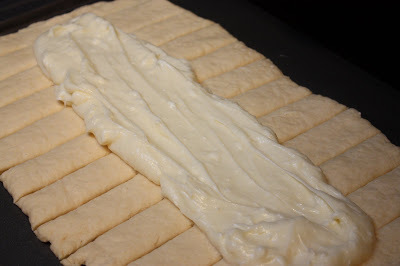 Cut lines on each side of the dough at 1 inch intervals. Fold each strip over, alternating sides. Bake at 350 degrees for 20 minutes. Remove from the oven. Spoon jam down the center and bake for another 5 minutes. Hello, Friends. I'm Becca. I'm a teacher, and when I'm not in the classroom, I'm doing everything I can to create a happy home. I love to cook, bake, garden, sew, quilt, teach, and simply spend time with my family. I don't consider myself to be an artist, but I strive to find the art in the everyday things I do to make our house a home. Join me as I quilt you up some comfort or warm you with some cookies!